You may know Microsoft Access as the most famous software to build database apps. It represents an absolutely versatile tool to create any number of applications that work with relational databases, forms, and workflows. While a great option with a rich set of features, developers sometimes struggle to know actual use cases of apps they could build by using Microsoft Access. Most of the development happens to be on-demand: as other departments float requirements, the IT department uses Access to quickly build custom apps. Those without IT smarts should simply be looking at a do-it-yourself database app builder. Today, we will see different examples of database apps you can build with Access. Software Matter crafted a great step-by-step guide to help you go through the entire development of a simple inventory management system. CRM is perhaps the most common business software for sales teams out there. There are many vendors offering generic and tailored solutions for companies across the board. Out-of-the-box CRMs cover generic requirements: capturing contact information, managing the stage of the purchase decision, keeping track of sales success with reporting etc. On the other hand, some companies find their CRM needs so specific they simply decide to build their own system. 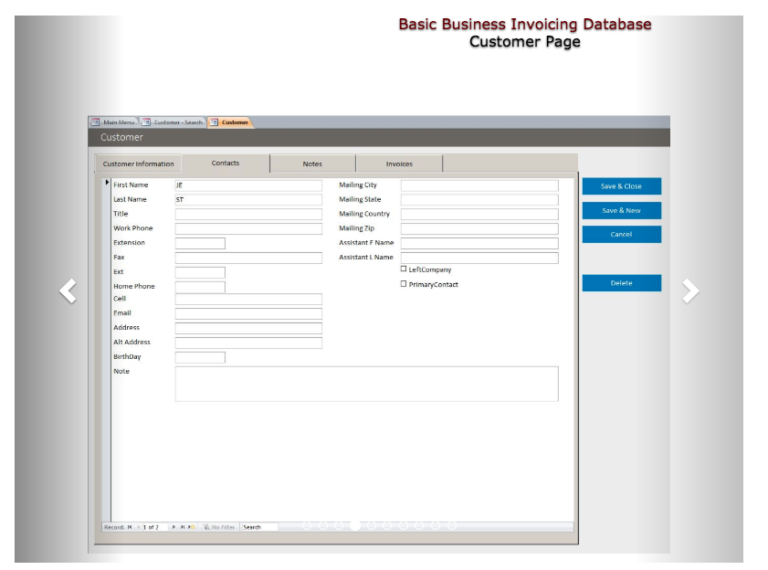 You can see this tutorial about how to set up your own CRM with Access made by Arkware. Project management happens to be one of the key “collaboration” needs in any organization. These systems are basically composed of a set of tasks and subtasks that contain fields such as dates, descriptions, current state, assignees etc. If you want to see an advanced project management software, you may want to take a look at HyperOffice’s project management module. 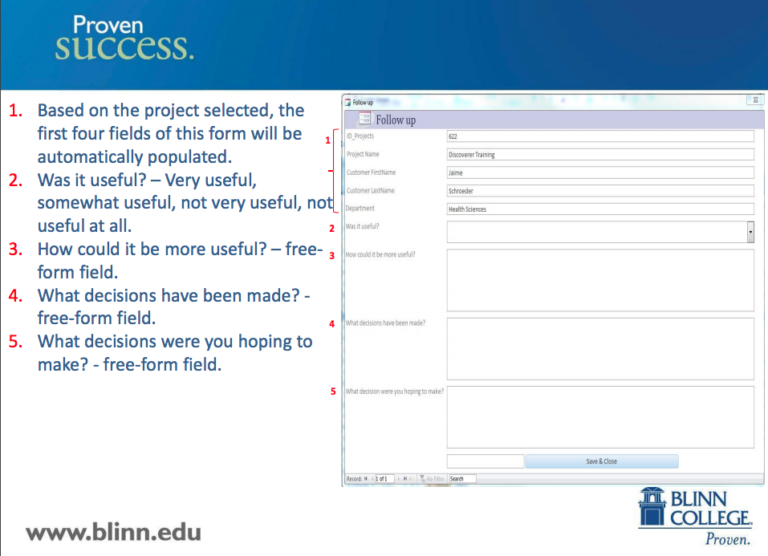 For this example, see Proven Success’ detailed PDF tutorial about how to create a project management module with Microsoft Access. On a daily basis, doctors need to store and manage their patients’ data, such as history, profile, and medical observations. A lot of this information was managed manually, but with more digital technology entering the healthcare space, and greater regulatory requirements, organizations are opting for automated systems. To build your own patient recording app with Access, simply check Source Code Tester’s tutorial to set up yours. While useful, Microsoft Office suite products like Access and Excel tend to be very plain; this is why Twilio went very creative to use its API to communicate with Microsoft Access to create a great new feature: real-time alerts through SMS messages. Just imagine notifying in real-time everyone about an important input or interaction with their app. SMS alerts are a great way to add instantaneity (is that a word?) to their database apps. You can create a database app to assign each customer a specific value, products, calculated taxes, and additional expenses to instantly create their invoices—and this is exactly what this Microsoft Access expert does in this tutorial. One of the critical processes in businesses is managing suppliers and providers; they don’t just represent an expense that should be reduced as much as possible, they are also the input that lets companies create their end product. Working with several providers may become complex; you need to manually manage each of them. You can see an example of an Access database application for this purpose here, built by Access to Go. Simple processes are often ignored, and can be a creeping resource sap. This is often the fate of employee management. If you don’t want to go down this path, you can start building your own HR application by visiting this tutorial and example. A Microsoft Access Online alternative? The immense potential has prompted most organizations to move their tech infrastructure online; Microsoft Access responded with a cloud version within its Sharepoint suite. But, unfortunately for many developers who expressed their discontent, Microsoft announced they’re retiring Access online and offered Microsoft Power Apps as an alternative — which has so far fallen below expectations. That’s exactly why Hyperbase often shows up as a Microsoft Access Online alternative – create beautiful forms with a simple drag and drop interface, connect databases, and even automate workflows without high end IT skills. If you want to give Hyperbase a try, we can help you migrate from your current [legacy] Microsoft Access system, for free. Get started here! The post Microsoft Access databases examples for common business needs appeared first on . Service Providers vs OTT Vendors: Who Will Win the Battle of Cloud Data? What Does the FaceBook IPO Mean for Social Business?